"MIB3" Director Barry Sonnenfeld: Tommy Lee Jones Really a "Goofy Kid"
What’s just as entertaining, quirky and off-kilter as a Barry Sonnenfeld film? A conversation with Barry Sonnenfeld. The director of such mega-hits as the “Addams Family” films, “Get Shorty” and the “Men In Black” franchise (the third of which is about to hit theaters) – not to mention the cinematographer behind classics including “Raising Arizona,” “Big,” “When Harry Met Sally,” “Miller’s Crossing” and “Misery,” Sonnenfeld is also one of Hollywood’s most engaging raconteurs, unafraid to skimp on behind-the-scenes details if it means sacrificing a laugh. But don’t let his disarming charms make you think he doesn’t take the work of being goofy seriously. During a conversation with PopcornBiz, Sonnenfeld suggests the Jones is entirely correct. What was irresistible about making another “Men In Black” film, the things that made you want to do it again? How did Josh get on your radar to do that channeling-style take on Tommy that he does? Did you hear him do an impression as a party joke or something? Brolin thinks that's what happened. For me, the first thing was seeing him in 'W.' I don't know if you saw the movie, but I thought that he was extraordinary. Never has an actor created more tension in a movie by eating. In every scene Brolin is eating a tuna fish sandwich, or when he meets his future wife he's eating French fries. There was so much tension in just him eating, and so I thought that he was fantastic in 'W.' because he wasn't doing an imitation, he was doing an interpretation. So there's that. Then he was on the award circuit for 'No Country For Old Men' and I was on the award circuit because I'd directed this TV show called 'Pushing Daisies,' and I know the Coens really well because I shot their first three movies [as cinematographer]. So I met Brolin a couple of times, and I think he may have done a Tommy Lee Jones impersonation at a party where I was at. But then the other thing is that both Tommy Lee Jones and Brolin have physically huge heads! If you look at any pictures of Tommy from the Harvard football team or something he looks like Brolin, or Brolin looks like Tommy. The first time that I saw Brolin I said, 'I cannot wait to see what your head looks like in 3D,' because it's HUGE! So, yeah, Brolin did do an impersonation of Tommy, but that's not why I hired him. Tell me about that unique chemistry the films sparked between Will and Tommy – who off screen seem to be just about as diametrically opposed, personality-wise, as J and K – and how it’s evolved from day one to now. Let's start at the beginning: My wife – I call her Sweetie – Sweetie and I read scripts together. She gives me a 40-page head start, and then we read the script. We finished 'Men in Black I' probably in 1993. I turned to her and said, 'Tommy Lee Jones,' and she turned to me and said, 'Will Smith.' This was before 'Independence Day' or anything. The thing that was really helpful, I think, about 'Men in Black I' and Tommy and Will's relationship – not that anyone can be NOT instantly sucked into the joy of being with Will, because he's just a life force – is that Will was not available for the first few weeks of shooting because he was finishing 'Independence Day.' So the first several weeks on 'Men in Black I' was only with Tommy. It was the early stuff where we're in the desert and he arrests Mikey, the multi-armed and -flippered alien. So when Will came onto the set, it was Tommy's set. That was really helpful, because Will came on in effect as an equal and not as the star and they didn't start at the same time. Will and Tommy instantly loved each other. Tommy has several traits that people don't know about as it relates to the way we work together. This will surprise you, because it's not the Tommy that you [the press] know: Tommy is like a really big, goofy kid in that he constantly is breaking everything, every prop. 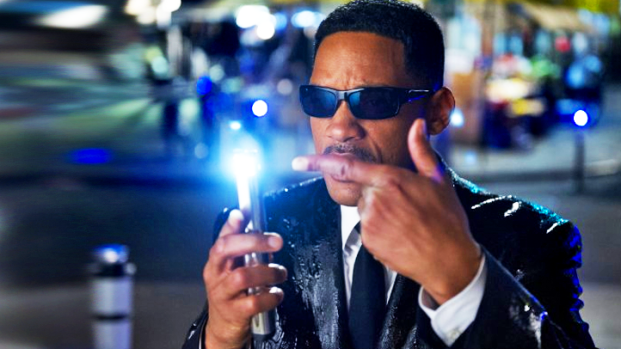 The Neuralizer on the first 'Men in Black': by the time that we were done we were cobbling pieces. I remember the prop guy saying, 'Dear Lord,' whenever Tommy had the Neuralizer because we knew that he was going to break it. Also – and this was something that became very funny and joyful for Will and really allowed the three of us to bond – unlike real guns where you shoot blanks, our guns don't make any sound. Without fail Tommy Lee Jones, for hundreds and hundreds of takes over the course of three movies, ruined takes by making the sound of the gun while he shot it. So, Tommy would go [makes a laser sound] and I'd go, 'Cut.' Tommy would go, 'What?!' And Will would be in hysterics because Will was standing next to Tommy and knew that Tommy made the sound of the gun again. So Will and Tommy and I have a different experience than anyone sees. Tommy and Will and I laugh all the time together. I know you think that I'm making this up because you interviewed Tommy, but I'm telling you that they love each other! I love both of them. The first one was hard for me and Tommy, because Tommy was in a comedy and hadn't been in a comedy before. He thought that he had to be funny and I was constantly saying…the phrase that I used was 'Joe Friday – Government issue. Don't be funny. Don't be funny.' And Tommy didn't realize that George Burns is funnier to me than Gracie Allen and that neither of them are funny if they're both playing Gracie Allen or both playing George Burns. Tommy, until he saw the first movie, didn't realize how funny he was. Once he saw it, When people asked him ‘How are you so funny?’ Tommy's quote was 'It's simple: Stand next to Will Smith and do whatever Barry Sonnenfeld tells you to.' That's the way it's been all through 'Men in Black II' and 'Men in Black III.' Truly, no one makes Will laugh more than Tommy does. Do you get why 'Men in Black' became such a phenomenon, and has remained so popular? I don't know why one of the movies I direct works so well, and then another movie I direct doesn't catch on with the public. I never really understood why 'Get Shorty' worked. My wife and I were so disappointed in that movie until we saw it with other people. We thought that no one would get it. On the first 'Men in Black,' that was the summer of 'Batman and Robin' and 'Jurassic Park 2.' We were just flying under the radar and I felt that the movie felt too small, didn't have enough explosions. So to me, I'm not exactly sure why it works. I just know why it works for me: it works because no one has a clue. Everyone thinks that they know what's going on, but really we don't have a clue. In fact, that was instrumental in one of my favorite speeches for Tommy Lee Jones in the first movie, where he says, 'A thousand years ago the Earth was the center of universe. Five hundred years ago everyone knew the earth was flat. Imagine what you'll know tomorrow,' when he recruits Will. And it's true. When I was growing up butter was good for you. Then margarine was good for you and butter wasn't. Then margarine wasn't. Whatever we believe to be true and reality now will be proven to be false in the future, and that's kind of cool. So what I'm saying is relax, because you don't have a clue.